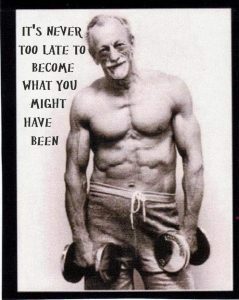 It’s never too late to start working out and living a healthy lifestyle. If you’re fit now, staying fit as you get older can be harder and even more difficult is getting into shape. It’s not impossible to do either one, but it does take consistent effort. Whether you make it a practice to take 10,000 steps a day, work out in the gym regularly or participate in activities that require physical exertion—which does not include pushing the remote button—keeping active helps your heart stay healthier and boosts your brain power in the process. Strength training not only helps you stay strong and thin, by helping you lose weight. It helps improve balance and keeps osteoporosis at bay. Osteoporosis responds well to weight bearing exercise. In fact, one study showed that it actually works better than some medications for it. It can slow the progress of bone loss and even help build bones stronger. Improving balance is just as important as building bones. One fall can change a self-sufficient individual to someone that can’t live on their own. A healthy diet is extremely important for staying fit. No matter what your age, you need the right nutrition to build a stronger body. As you age, absorbing those nutrients can become less efficient, which makes it even more important to eat healthy. Not only do foods high in antioxidants help protect every cell in the body from free radical damage, eating healthy can boost your brain power and improve your overall health. To keep your brain younger, consider healthy fats, from sources like olive oil, avocado, salmon and nuts or seeds. Eating more whole foods in the form of fruits and vegetables boosts the nutrition available to your body. You may not feel as thirsty as you once did, but drinking plenty of fluids is even more important as you age. Next to oxygen, water is the most important thing to keep people alive. The older you get, the less your body warns you about getting thirsty with signals like thirst. That’s why many health professionals suggest people over 50 drink water even if they’re not thirsty. Dehydration can lead to severe results such as fever, dry skin, confusion and dizziness. Some mental conditions in older people are often the results of dehydration. Laugh and smile more. That’s right! It’s really healthy for you. Studies show that people who smile more often live longer. Even if you’re sitting alone, let out a big belly laugh and you’ll notice you feel better. Get a pet. While you might not think that a pet could help your fitness, it does. Pets require care and that gets you moving, especially if you have to walk a dog. They also provide love and affection. Studies show that people with pets have lower blood pressure and improved cholesterol levels. Walking faster can help you stay fitter, particularly if you’re taking longer strides. One study shows that people who walk faster, live longer. Another shows that those with longer strides, also live longer. Get social. Staying connected with others helps improve your life and increase your longevity. To get a bigger bang out of it, join a group that works out or one that participates in activities that provide more exercise.